Found in a vast area of the central and northern parts of the country. This includes the whole of the Free State, the Kalahari, the whole of the North West province, Northern Province, Gauteng and Mpumalanga, but excludes the Kruger National Park, Swaziland and most of Lesotho. Is is also found in a small part of the North Cape's most upper north western coastline. 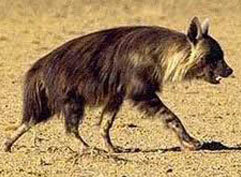 The brown hyena isn't a true hunter. It isn't fast and may be called clumsy, and eats the leftovers of dead animals or fish, or searches for ostrich or other bigger bird's eggs. Those living near the sea will search for a dead whale or shark along the shore. It's sense of smell is well developed and it will cover many a mile in search of a carcass which they‚ know by nose‚ to be out there. It is a wary animal and will most likely not be seen in daylight. It leaves behind two sizes of a dog like spoor. This animal is always in search of a carcass and has the teeth and jaws to roundup a carcass of the biggest game, swallowing crunches of bones that would be fatal to other animals.